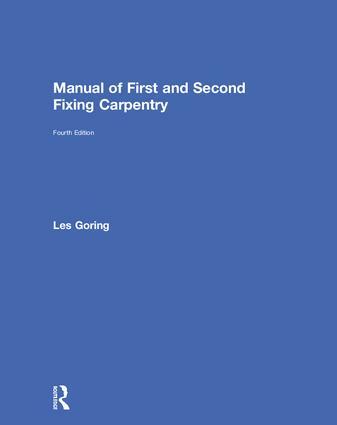 Les Goring’s book covers all the detailed knowledge required for carrying out first fixingcarpentry – such as modern and traditional roofing and fitting and fixing modern and traditional floor joists on new-build sites before plastering or drylining of walls and ceilings takes place – and second fixingcarpentry – such as fitting staircases, hanging doors, skirting and architraves and kitchen units after dry-lined plastering has taken place and the shell of the building is watertight. In the opening chapters, this work also covers reading-of-drawings' knowledge, tools and fixing-devices. This new edition, with over 500 coloured drawings supporting its step-by-step approach, has been updated throughout to take into account current industry practices and changes in the UK’s Building Regulations. Two new chapters have also been added, covering the formwork carpentry for casting in situ, reinforced concrete stairs and landings, and making and fixing different shelf arrangements to correct spans. The breadth of coverage and clear ‘how-to-do-it’ text makes this book an essential in-and-after-college resource for the 2000 apprentices per year taking NVQs and the 1500 students following Construction Awards within the Wood Occupations from the City & Guilds’ Construction Skills. The in-depth technical detail and practical focus makes this book an essential purchase for all aspiring woodworkers, craft teachers and construction lecturers – to either read now and/or use as a future reference manual. It should also be of value to general builders and DIY enthusiasts, whose carpentry knowledge might (understandably) be sketchy in certain areas. "… indispensable to students … the book is laid out very neatly … an excellent glossary of terms." Les Goring is a member of the Chartered Institute of Building and a former Senior Lecturer in Wood Trades at Hastings College of Arts & Technology. In addition to being a Member of the Institute of Wood Science, he is also a Fellow of the Institute of Carpenters and a Licentiate of the City & Guilds Institute. All drawings in Les Goring’s books were drawn by the author.